The Economy Inn offers 'luxury for less', featuring a swimming pool, whirlpool suite, cocktail lounge, cable television, and free high speed internet access. A microwave and refrigerator is available in all rooms and irons with ironing boards are also on hand. Guests may make local telephone calls at no charge and free coffee is offered in the lobby. Guests are also invited to use the hotel's fax and copy services. 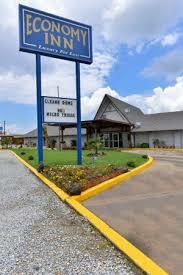 The Economy Inn is located near a number of Ardmore area attractions.